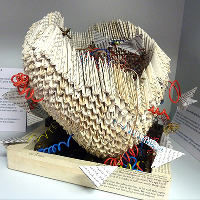 Curated by Simon Ryder, this major exhibition of book art marks 200 years since the first edition of Mary Shelley's 'Frankenstein or, The Modern Prometheus' was published. This is the last venue in the exhibition's tour which launched in summer 2018. Works by some 50 individual artists and three collectives have been created for the exhibition, with an enormous variety of approaches, materials and techniques. Some of the works have been made in small editions; some are unique works.